Reference number for this case: 4-oct-54-Lézignan. Thank you for including this reference number in any correspondence with me regarding this case. Two inhabitants of Lezignan saw a 30-ft. disk land in a field between the villages of Lagrasse and Aude. When they approached it the machine flashed a blinding light on them, and made the usual getaway. The author indicates that in the evening of October 5, 1954, two residents of Lézignan drove in a truck on the secondary road Nr.3 and saw a metal disc approximately 10 meters in diameter which came down slowly from the sky and landed in a field between the village of Lagrasse and the hamlet of Villemagne in the Aude. The two men stopped their truck and courageously jumped on the ground and walked towards the spacecraft, which at their approach emitted a bright gleam and took off at once. Aimé Michel writes that on October 4, 1954, in Lézignan, in the department of the Aude, two residents of this village, Mr. Gardia and Mr. Darzens, were returning home driving a truck during the night. They were driving on national road 3 when they saw a luminous object gently descending to the ground in a field near the small village of Lagrasse. They pulled off to go see the phenomenon, but the object suddenly rose up while producing intense luminosity. Oct. 04, 1954 Lezignan (France). The author indicates that on October 4, 1954, between Lagrasse and Villemagne close to Lézignan in the Aude, two men driving a truck saw a luminous flying object which descended slowly towards the ground, then suddenly, rose in an explosion of light. Ufologists Garreau and Lavier date the case of October 3 not 4. Indicating that their references are a newspaper cutting and personal file, they write that two inhabitants of Lézignan, Mr André Gardia and Mr André Darzens, driving by truck on the Secondary Road RN3, while arriving at the height of Lagrasse, saw a machine in the shape of a disc landed in a field between the village and the hamlet of Villemagne. Mr. Gardia stopped the truck, and the two men went out and proceeded to move towards the apparatus, which they estimated of ten meters in diameter. But they were dazzled by an intense gleam, and the machine quickly disappeared in the sky. The two authors indicate that in the night from the 3 to October 4, 1954, André Garcia et André Darzens who drove a truck on the Departmental Road D3 close to Lagrasse in the department of Aude, saw a machine in the shape of a disc which was posed in a field between the village of Lagrasse and the hamlet of Villemagne. According to witnesses', this apparatus measured approximately 10 meters in diameter. The two men stopped their truck and are courageously went out, then moved towards the machine. The disc emitted a bright gleam which wrapped them and took off at once. The authors give no source but note that Jimmy Guieu in "Black Out sur les S.V." give October 5 as date. Yet another one of those brief touchdowns by a UFO was reported on the 4th. Truck drivers Andre Garoia and Andre Darzais were travelling a high way near the town of Lezignan when they saw a luminous disc, an estimated 30 feet across, coast to a momentary landing. With a surge of power the disc soared skyward while emitting a burst of white light. 41. 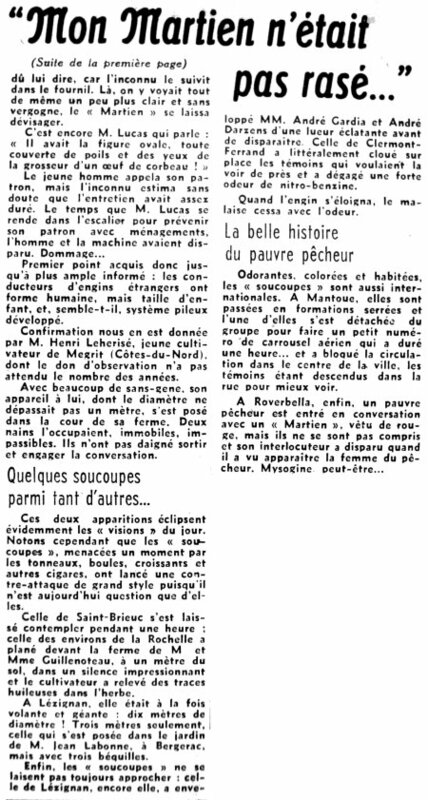 The Belgian ufologist indicates in her catalogue that in 1954, on October 4, in France in Lézignan, "André Garcia and André Darzais drove a truck between Lagrasse and Villemagne when they saw a luminous object going down slowly towards the ground. It measured approximately 10 m in diameter and set out again with an explosion of light." She indicates that the sources are "France-Soir, 7 Oct. 1954" and "Jacques Vallée: 'Chronique des apparitions ET' - DENOEL 1972 - J'AI LU COLL. - p. 267". 1954 - October 4: Andre Garcia and Andre Darzais were driving a truck between Lagrasse and Villemagne and were near the village of Lezignan, France when they saw a luminous object coming slowly to the ground. It measured about 10 meters in diameter and took off with a burst of light. 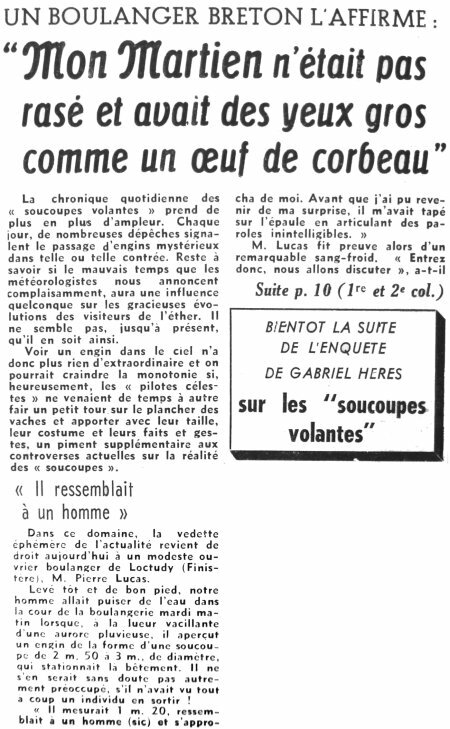 (Sources: France-Soir, October 7, 1954; Jacques Vallee, Passport to Magonia, p. 217). In Lézignan (France), André Garcia and André Darzais drive a truck in Lagrasse and Villemagne when they see a luminous object going down slowly towards the ground. It measured approximately 10 m in diameter and went away with an explosion of light. The website indicates that on 4 October 1954 in Lezignan, France, "A luminous object, ten meters diameter" and "Andre Garcia and Andre Darzais were driving a truck between Lagrasse and Villemagne and were near the village of Lezignan, France when they saw a luminous object coming slowly to the ground. It measured about 10 meters in diameter and took off with a burst of light." The website adds: "Andre Garcia and Andre Darzais were driving a truck between Lagrasse and Villemagne when they saw a luminous object coming slowly to the ground. It measured about ten meters diameter and took off with a burst of light. One ball was observed." Luc Chastan indicates that in the Aude in Lagrasse on October 3, 1954, at an unknown hour, "In the night from the 3rd to 4th October, the witnesses, who drive by truck on the D3, see a machine in the shape of a disc which is posed in a field between the village of Lagrasse and the hamlet of Villemagne.The apparatus, the witnesses stated, measures approximately 10 meters in diameter. The two men stop their truck and, courageously jump on the ground then move towards the machine. The latter emmits a bright gleam which wraps them and takes off at once." *Oct. 4, 1954 - Andre Garcia and Andre Darzais were driving a truck between Lagrasse and Villemagne and were near the village of Lezignan, France when they saw a luminous object coming slowly to the ground. It measured about 10 meters in diameter and took off with a burst of light. (Sources: France-Soir, October 7, 1954; Jacques Vallee, Passport to Magonia: A Century of Landings, p. 217, case # 189). [-] Indicates sources that I have not yet checked myself. [---] "La Realidad de los OVNI a Través de Los Siglos", book by Luis Anglada Font, Editorial Kier publishers, Argentina, 1968. [am1] "A Propos de Soucoupes Volantes", book by Aimé Michel,reprint of "Mystérieux Objets Célestes", Planète publishers, France, 1969. [jv1] "Chronique des Apparitions Extra-Terrestres", French translation of "Passport to Magonia", book by Jacques Vallée, Denoel publisher, France, page 267, 1972. [gl1] "Face aux Extra-Terrestres", book by Charles Garreau and Raymond Lavier, Delarge publisher, J'ai Lu, France, pp 80-81, 1975. [am1] "Mystérieux Objets Célestes", book by Aimé Michel, Seghers publisher, France, page 190, 1977. [lg1] "The Fifth Horseman of the Apocalypse - UFOs: A History - 1954 October", monographie par Loren E. Gross, USA, page 9, 1991. [dj1] "Encounters with aliens on this day - October 4", compiledn by Dr. Donald Johnson, UFOCAT, www.ufocat.com/on_this_day/October04.html. 1.0 Patrick Gross March 16, 2009 Conversion from HTML to XHTML Strict. First formal version. Additions [go1], [jb1], [ud1]. 1.1 Patrick Gross March 13, 2010 Additions [jg1], [lc1]. 1.4 Patrick Gross October 9, 2014 Addition [ni1]. 1.6 Patrick Gross December 17, 2016 Additions [lg1]. 1.7 Patrick Gross January 7, 2017 Additions [gb1].